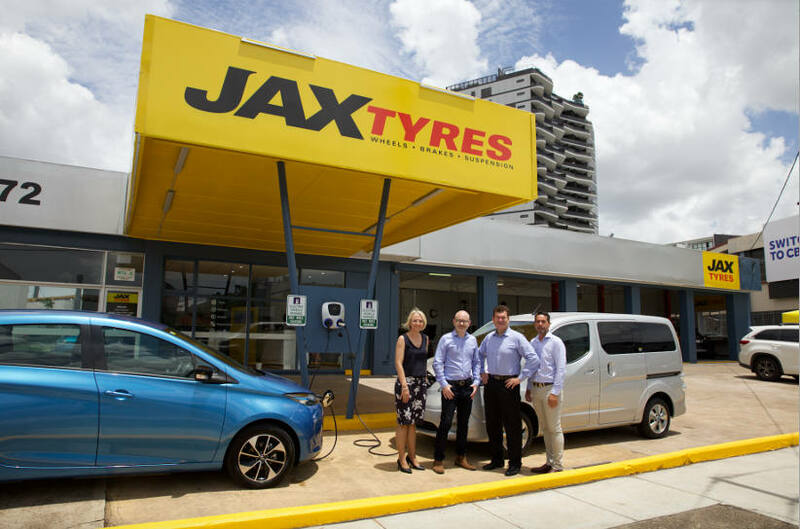 JAX Tyres have sent a signal to the fleet market that they will be ready to service and change tyres on electric vehicles once they become common place in Australia. In January they announced that their newest store in the Brisbane suburb of Woolloongabba will have a free EV charging station and that its the first of many to be installed. The station is part of a 2019 nation-wide roll-out by JAX to future-proof their 86 stores in partnership with electric car utilities experts, EVolution. This will be the first station for a tyre or mechanical store in Australia as the industry adapts to the technology changes that are disrupting the automotive market, including new types of fuel and energy storage solutions, as the automotive race to zero-emission targets ramp up. JAX Tyres CEO Mr. Steve Grossrieder believes diversification is a good thing for the automotive industry and that JAX Tyres is ahead of the market in providing solutions for their customers. “We need agility to service all technologies moving forward, especially in the automotive race to zero-emission targets. JAX Tyres has a very solid service network through our best- in-class franchisees and longstanding relationship with our trusted group of Global Top ranked brand suppliers including EVolution. Choosing the right partner is critical and EVolution have the expertise and access to the best quality equipment on the market. Mr. Grossrieder confirmed that the diversification strategy will continue throughout 2019 and that new JAX Tyres stores in South Australia and Western Australia will be equipped, ensuring they can continue to serve customers into the future. Russell Shepherd, CEO of EVolution said, “We’re very excited to be a part of JAX’s plans for a sustainable future. Drivers will be able to charge their cars either as JAX customers or as passers-by. Furthermore, and unique to JAX Tyres, any electric vehicle will be topped up via portable chargers while being serviced. The public JAX Charging network will be made up of a combination of Charge-Amps AURA Dual Port AC 22KW EVSEs and Tritium DC Fast Chargers. “Once complete this will be the largest retail based EV charging network in Australia. All charging will be “free forever’’ and accessible without the need for swipe card or mobile phone app,” finished Mr. Shepherd.